Sunny’s used to feeling different, no matter where she lives. She was born in New York City to Nigerian parents, but they moved back to Nigeria when she was nine. Sunny feels like she’s stuck between America and Nigeria. She’s American, and looks West African, but even her Nigerian peers don’t accept her, because she was born with albinism. Her skin doesn’t have pigment in it, which means that it is very sensitive to the sun. She can’t even play soccer, even though she loves it, because she gets sunburned so easily. One tense summer, when her classmates are reeling with the news of a serial killer targeting Nigerian children, Sunny learns why she’s always felt different: she has magical powers. Not only does she have very powerful magical skills, she also learns that two of her friends are similarly gifted. Sunny soon develops a dual life: school and chores during the day, and frantic magical study and practice during the nights. She learns shapeshifting, juju, and spells, trying all the while to keep her second life secret from her peers and family. The serial killings escalate, and the magical authorities appeal to the young trio for help: can they use their powers to track down the killer? He’s not just a mortal; he’s Black Hat, the worst of the worst, a wizard who went terribly wrong. Can Sunny and her friends defeat the evil Black Hat? Or are his powers so strong that he cannot be stopped? The fate of Nigeria rests in the hands of a twelve-year-old. We’re lucky she’s one as awesome as Sunny. Since I read Harry Potter in the seventh grade, I’ve been looking for books like it. 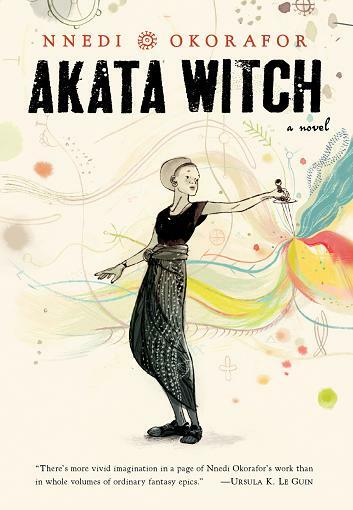 Lots of books have similar themes and plots, but none of them feel as original and creative as Good Old HP…except Akata Witch! This is a definite must for those of you who love Harry Potter. Sunny will be everyone’s new favorite underdog, and we’ll all be wishing we knew juju like she does. I can’t wait to read more of Nnedi Okorafor’s books! The second in this series, Breaking Kola, is due out in 2015.